According to the data and stats that were collected, 'Ask Dave Taylor' channel has an outstanding rank and belongs to Web Based category. Despite such a rank, the feed was last updated more than a month ago. 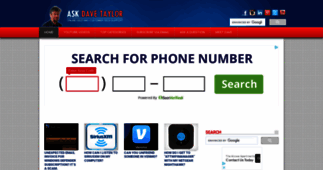 In addition 'Ask Dave Taylor' includes a significant share of images in comparison to the text content. The channel mostly uses long articles along with sentence constructions of the basic readability level, which is a result indicating a well-balanced textual content on the channel. Online Help, Customer Tech Support, Gadgets and Gizmos! Long articles are widely used on 'Ask Dave Taylor' as elaborated and interesting content can help the channel to reach a high number of subscribers. In addition there are a few medium length articles. 'Ask Dave Taylor' mostly contains texts of a basic readability level which may show their aim to reach a wider audience. Besides, there are articles of intermediate readability, which make up more than one third of all content on the channel. Unfortunately Ask Dave Taylor has no news yet. How can I share Notes from my iPad? Set my Android phone to vibrate only on calls?